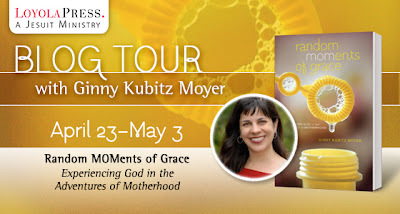 Shelly and I are so thrilled to be part of the Blog Tour for fellow CatholicMom.com contributor, Ginny Kubitz Moyer’s new book, Random MOMents of Grace. 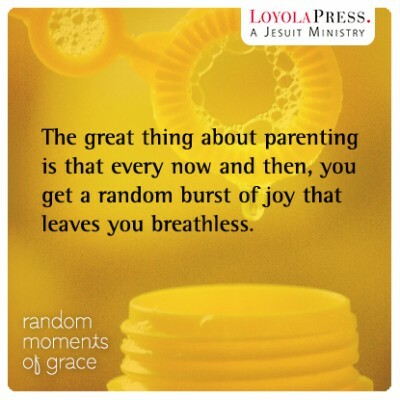 When I read the tagline of the book – Experience God in the Adventures of Motherhood – I knew this was a book for me. All moms know the crazy that is motherhood and how hard it can be to carve out a little one on one time with God with little people running around. Ginny has an absolutely beautiful way of weaving personal, mom stories into the bigger spiritual picture. We are all living our faith in the way we minister to our families, it can just be a little difficult to see at times while we are sleep deprived in the midst of it. That put a huge smile on my face. What a great way to think of it. I mean, who hasn’t fallen asleep while trying to have quiet time with God at the end of a long day? Why does it have to be quiet and alone time when we reach out to Him? Motherhood means needing to recognize God working in our lives in ways we don’t expect or haven’t seen before. Ginny accomplishes this task in spades. She writes as if she is a personal friend sharing her joys, frustrations, hopes and spiritual dreams with you. There were many moments when I cried (as only a mom does) because I recognized the same worry, concern or revelation in my own life and other times when I smiled and laughed thinking she knows my children. I didn’t want to rush through this book, but wanted to savor the stories and wisdom shared in its pages. This became my “carpool line” book that enticed me to leave the house a little early so I could spend daylight time reading it. Mother’s Day is quickly approaching and this book would be an excellent gift for all moms with kids underfoot wishing they could dedicate more time to their spiritual life. And, if you run over to Loyola Press' website right now, you can get a special price until May 5, 2013. Shhh, don’t tell Shelly, but I’ve got her a copy on the way. Thank you Ginny for giving other mothers and me this book. It is refreshing to hear you voice some of the same concerns, frustrations and joys of parenting that we all face with grace that only God can bring. I love being reminded to look for God working in the midst of the chaos of motherhood. He is there always in little ways that we sometimes miss. from "Random MOMents of Grace"